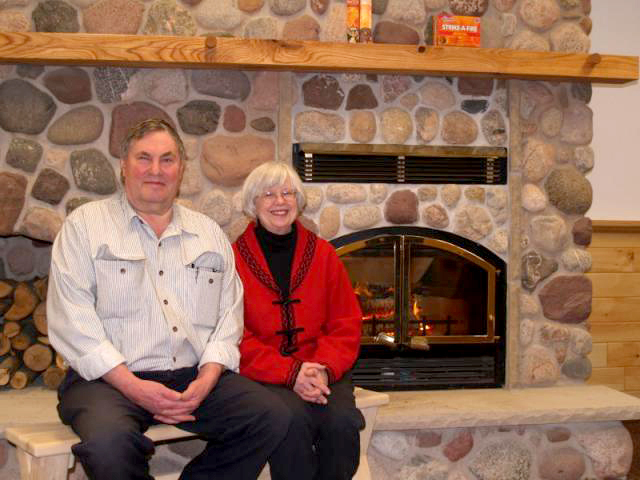 The work and life of Robert and Ruth Nara. You will find that as with virtually anything in the health spectrum, the first and best “medicine” is prevention, but we realize that there will be problems in spite of your preventive efforts … and we will help you understand these problems and what to do about them: A sort of “dental first aid” approach. If you haven’t encountered the term “frame of reference” by now – or if you have, but don’t fully understand it – you should be aware of its importance to your use of the information in this book. A frame of reference is the way you view any given subject, based on preconceived ideas … on all of the concepts and misconceptions you’ve acquired relative to the subject at hand. The typical frame of reference to oral health is woefully incorrect; but it is nearly impossible to understand and to use correct information unless the old frame of reference is changed. Whenever you encounter that phrase in this book, think of it as a reminder that the information you are reading at that point is something that is contrary to “popular belief”, and that you should perhaps slow down at that point and give it extra attention. Why are you about to read this book? -isn’t it because you’re convinced you haven’t been getting the whole truth from the dental profession? You’re quite sure that if you only knew how, you could take excellent care of your health, and your family’s health, without encountering the backbreaking (and rising) medical and dental costs of our time. You’re not alone. In fact, pollster Louis Harris wanted to find out how many people think like you do, and so the famous Harris Poll went out and dug up an interesting fact: More than nine out of ten Americans share your growing belief that simply living sensibly will do more good than any doctor or medicine. That same poll showed that perhaps seventy percent of the public believes doctors could be good sources of help -information – on how to stay healthy… but only forty-seven percent believe doctors will give them the advice they need. Nine out of ten suspect that something’s not quite right with what they’re told. Seven out of ten think professionals could help them. Less than half believe the professionals will help them. In early April, 1979, authors Dr. Nara and Steven Mariner attended a conference in Milwaukee, Wisconsin. The purpose of the conference was so that National Aeronautics & Space Administration (NASA) bio-medical engineering experts and highly-placed members of the American Dental Association (ADA) could compare notes on the “state of the art” of dental techniques. It was intended to be an exposition of how to bring the best of dentistry to people in remote, inaccessible areas -perhaps as a fore-runner to populations in space; certainly in response to areas of the world where dental offices are impossible and dentists are scarce. It was, from the viewpoint of most of those present, a smashing success. As far as Oramedics is concerned, it was a discouraging failure -except that it underlined the crying need, now… today … for the public to have access to the kind of oral health approaches Oramedics has developed. The crowning achievement of American technology was to bring space-age materials and techniques to bear on equipment. The conference’s high point was when people learned that we can now take all of the archaic devices from a dentist’s office … the barber chair, the drilling equipment … the works … and put them into a back pack weighing in at just under 100 pounds. Now a dentist can hire a porter to lug his office up a mountain, or through a jungle -or into a space vehicle -and, once he’s arrived at his destination, he can set up shop and … right. Drill holes in someone’s teeth, or yank them out. It is discouraging and frustrating to see such an enormous expenditure of money and technology just to keep alive the fiction that diseased teeth are inevitable; and that the only person who can do anything about disease damage is a dentist with his mechanical tools. It makes no difference whether the office is up a flight of stairs over the dime store … or on someone’s back, at a miracle of only 97 pounds. What on earth -or in space -is that person doing with holes in his teeth to begin with? Dental disease doesn’t have to happen! We might as well imagine the spectacle of doctors lugging iron lungs around with them, looking for victims of polio in remote areas … so they can keep the victims alive for just a little while longer … but without taking along any Salk vaccine to prevent the disease in folks not already stricken. Dental disease -odontosis -is the result of an invasion of germs into the oral environment. It can be stopped at any stage of its development, simply and economically. It can be prevented. If odontosis is inactive, there won’t be any more holes in the teeth. If it’s stopped before it progresses too far, there won’t be any “yanked” teeth … or, as is predictable with the current “state of the art” for conventional dentistry, the ultimate loss of all the teeth. Nobody can “blame” NASA for spinning it’s ~heels on product development: The only source of information about dentistry is organized dentistry … and organized dentistry is still practicing “drill, spit and fill” techniques given up decades ago by the town barber. It comes down to this: There’s only one way for people in remote areas to avoid the pain and danger of disease-damaged teeth: They must learn to avoid the disease. There is no other sensible way for people in “remote areas” – and that covers a lot more territory than on the moon. People in ghettos are in “remote areas” -how many dentists practice in such places? Where would people get the money to pay them? People in rural America are in isolated places: Who can afford to lose a day’s work; to drive many miles to a dentist’s office, often only to be told to come back again in a few days’ time? Being isolated is as much a function of economics as it is geography: A person earning $140 per week take-home pay is as isolated as an astronaut as far as dentistry is concerned, even if he lives and works within walking distance of an office. People are “isolated” from dentistry by distance, by economics, by misconceptions as to what dentists do (or don’t do). People can be intentionally isolated from dentistry; especially the growing number of Americans who simply do not trust the medical / dental establishment to tell them the truth about self-help methods. The Harris Poll discovered in 1979 that 92% of all Americans believe simply living sensibly will do more good than any doctor or medicine. They are correct in that assumption, as far as oral health is concerned! It isn’t too surprising, given the somewhat astonishing “track record” of the American Public that people seem to come up with the correct attitude in spite of the “official” attitudes handed them by the establishment. In that same poll, less than half of the people interviewed believed they would get the right kind of advice from their doctors. 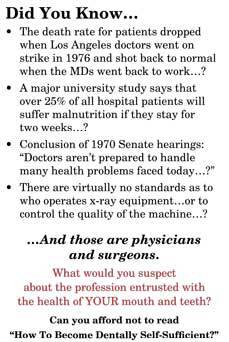 When you stop to realize that those “doctors” are the same sort who are encouraging NASA to spend millions of dollars to develop back-pack dental offices, it is refreshing to realize how difficult it really is to fool the American Public indefinitely. Organized dentistry has been able to fool “all of the people some of the time; and some of the people all of the time” – but, fortunately, the era is over when they could fool all of the people, all of the time. Those who have read Money By The Mouthful are aware of the resistance Oramedics has encountered in its attempt to tell people that dental disease lS unnecessary. In Money By The Mouthful it was made clear that organized dentistry responds to symptoms, not disease. Those who read that book – many thousands of people – asked Oramedics to publish another; one that told them how, in simple terms, to become dentally self-sufficient. That’s what this book is all about. A suggested method of using it would be to read it right through, cover to cover, without stopping to “study” any part of it. You’ll find that your understanding of dental disease (which we’ll call odontosis from now on) will increase as you go along. You’ll notice several reference chapters which you can use as guides, or to refresh your memory, when specific needs arise later. You’ll come to view this book as a sort of “home medical advisor,” but with a total emphasis on oral health. There are chapters on how to care for infants and for youngsters as well as adults. There are some relatively technical chapters which discuss disease mechanisms. These are necessary for your understanding and – while technically accurate – they are written in plain language. This book will not qualify the average person to be a Doctor of Dental Surgery; any more than a medical or first-aid book would qualify a layman to be a physician, an M.D. Situations can arise which are simply beyond the scope of this book or which require training and skills beyond the reach of a lay person. An accident which breaks teeth or severely cuts gum tissue, for instance, would obviously require medical I dental attention. It’s possible that severe disease symptoms could arise, causing intolerable pain or systemic poisoning. It is no comfort, at that point, to realize that it could have been avoided. If the situation exists it must be dealt with. In the event of any condition which isn’t clearly understood, or where there is evident potential for serious difficulty, the intelligent person will seek help from a professional. One of the purposes of this book, in addition to helping people become self-sufficient for a major percentage of their oral health needs, is to give them greater competence in deciding when and where to seek medical assistance … when that assistance is available. Of course the emphasis throughout will be on prevention of odontosis: The primary goal of Oramedics International is to help people achieve freedom from disease. When the oral environment is disease-free, the person will have become totally self-sufficient. The reader is encouraged to write to Oramedics International if there are any questions. Every inquiry receives the personal attention of a staff member and more often than not will be referred to an Oramedics Fellow, a practicing Doctor of Dental Surgery. All inquiries are answered. Mail should be addressed to: Oramedics International 200 East Montezuma Avenue Houghton, Michigan 49931. While unsolicited collect telephone calls cannot be taken, people may feel free to call, prepaid, with questions which are too urgent for mail handling. The telephone number is laic 906) 482-1419. So … read on; join the ever-increasing number of Americans who are achieving freedom from dental disease. We think you deserve better than inventions which allow conventional dentistry to bring an office into your living room -or in a mobile van -or on the moon -in order to plug holes or pull teeth that shouldn’t have been sick to start with. We rather like the idea of a much earlier inventor, Thomas A. Edison, who said: The doctor of the future will give no medicine but will interest his patients in the care of the human frame, in diet, and in the cause and prevention of disease…. Welcome to the dentistry of the future -today. Buy this book to read more! RobertNara.com © 2014. All Rights Reserved. 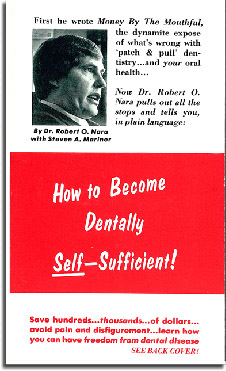 Learn life lessons and dental secrets from RobertNara.com.